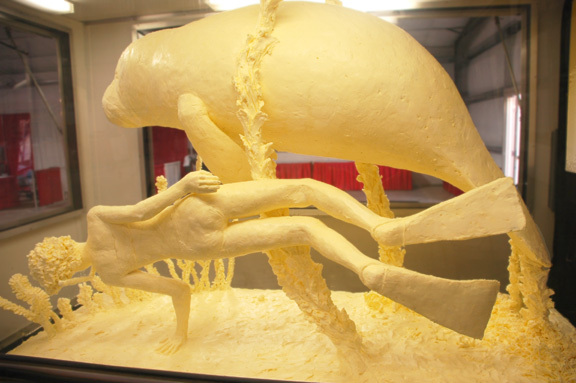 When it comes to chiseling 1,000 pounds of butter into life-size manatees or molding a Santa from cream cheese and mascarpone, no one does it better than Jim Victor. Just don’t ask him to use meat. That’s gross. The food sculptures can take Victor and his wife, Marie Pelton, up to a month in their Philadelphia studio, using heavy-duty cutting tools, whittling implements, and cheese graters. Years in the business: 30 or so. I made my first chocolate sculpture in 1982, but didn’t do any again until 1995. Did you attend art school with the intention of sculpting food? No. I started out with wood, and did my first chocolate sculptures in the 80s. But didn’t grow serious about food sculpting until the 90s, when I realized a real demand for it. I actually got my first butter-sculpting job through a wanted ad that my brother saw in a local Harrisburg, Pa. newspaper. As a sculptor, your opportunities are few and far between. 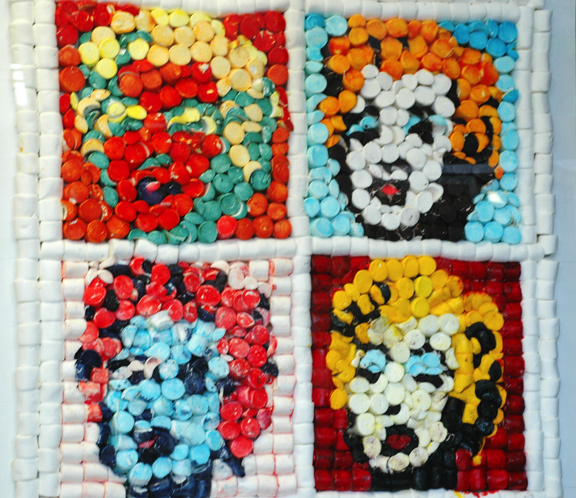 Andy Warhol’s “Marilyn Monroe” using marshmallows for the Orange County Fair in 2010. You work with quite a range of materials, from steel and wood to cheese and vegetables. A lot of the same sensibilities come into play; I have to think about textures and colors. But there’s an added concern with perishables, like fruits and vegetables. You have to create them the day before a show. Your workspace: We have a regular studio and two temperature-controlled trailers for sculpting on the road. The sides of the trailers are windowed so that people can watch. Many fairs also have butter booth facilities. How do you prevent the butter and chocolate from melting as you handle it? For butter, temperatures must be below 60 degrees Fahrenheit. Chocolate is a little more forgiving — it just needs to be away from the sun and moisture, and below 80 degrees. For cheese, we work with harder ones, like hard cheddar. Favorite edible medium: Parmesan cheese. Your toolkit: Lots of clay modeling tools, or wooden tools that I carve myself. For something slippery, like butter, I need a big handle. This butter manatee appears to be floating, but the seaweed supports the mammal’s hefty body mass, explains Victor’s wife, Marie. Victor works mostly with unsalted butter, but salted butter is softer and easier to shape. Which comes first, the subject or the medium? They’re usually commissions from corporate sponsors that want specific materials. After planning, we make armatures from wood, wire, or steel. That’s the skeletal frame around which the sculpture is built. People think we’re cheating, but you need an understructure to hold up the cheese, or chocolate, or whatever. Your strangest commission: It was for a politically incorrect-themed party in California. We made Fidel Castro out of fruits and veggies, and Hitler out of cheese. I didn’t see those on your website. It shocked me so much that I left those off. Is there any food you won’t use for sculpting? For a long time, I said I wouldn’t work with meat. Then I did, but just a little. I don’t want to work with big quantities of meat — I think that could be really gross. You’re not grossed out by 1,000 pounds of butter? Not really. The nature of your job involves a sizable waste of food, considering your sculptures are not for human consumption. We use waste butter from dairy plants that would be thrown away anyway. A lot of our butter is turned into biofuel using digesters on farms or at university campuses to run cars. Does the same go for cheese? No. We give some of [our cheese sculptures] to a food bank in Texas after a job. But for the most part, our sculptures can’t be eaten because we handle the material too much. We’re not chefs. Best part of your job: Getting commissions to do work you love. 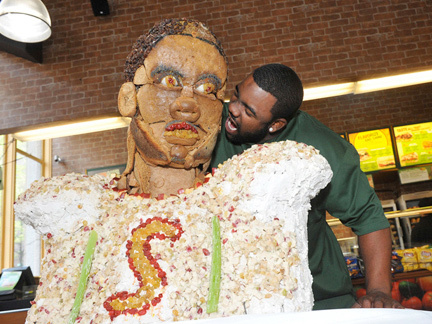 Mark Ingram, Jr., a running back for the New Orleans Saints, recreated in bread, raisins, cranberries, and chicken salad. Most challenging part of your job: The technical challenges and demands that people and corporations throw at us. For Subway, we recreate heads of NFL stars using sandwich materials. It’s like, how do you make [Washington Redskins quarterback] Robert Griffin III out of chicken salad? What would people be surprised to learn about your job? How difficult it is, both physically and technically. It involves a great deal of engineering and is very physically demanding. We’re lifting hundreds of pounds of butter. It’s also very long hours. For the past month, in preparation for a chocolate show in New Orleans, we’ve been working 10-hour days, seven days per week. 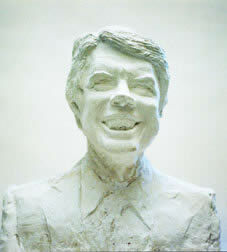 President Jimmy Carter, plaster, 1974. Your work in non-perishables is quite popular as well. Your plaster bust of Jimmy Carter currently resides in the Jimmy Carter Presidential Library. That’s a funny story. New York magazine commissioned that bust — they wanted to smash it to pieces and then photograph it for their cover, to symbolize [what everyone thought would be] Carter’s failed negotiations for peace in the Middle East. But it turned out that his deal pulled through. So I wrote a letter to Carter, offering him the head for the museum. He accepted. Average rate: We charge anywhere from $1,000 to $2,000 per day, depending on our work. But we don’t always make that much, once you factor in design, shipping, and hiring people to help. How do you unwind after a long day carving butter? With a stiff drink. There are only so many jobs you’ll find in the wanted ads. The most successful people figure out what they want to do and make their own jobs. Opportunities are very fleeting; don’t ignore any of them. 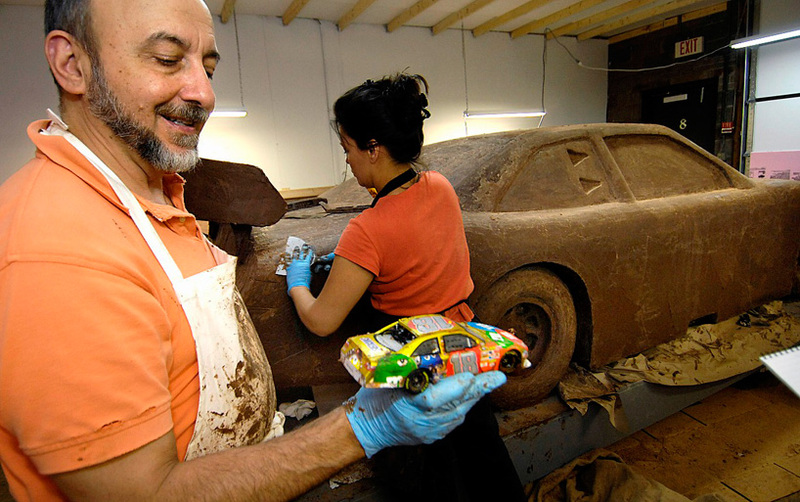 Meet more artists with creative palettes: the dirty car artist, the soap maker, and the pop-up paper engineer. This entry was posted in Art and Design, Cool jobs, Dirty Jobs and tagged chocolate art, food art, food sculptures, fruit sculpture, jim victor, metal sculpture, new york state fair by Megan Hess. Bookmark the permalink.